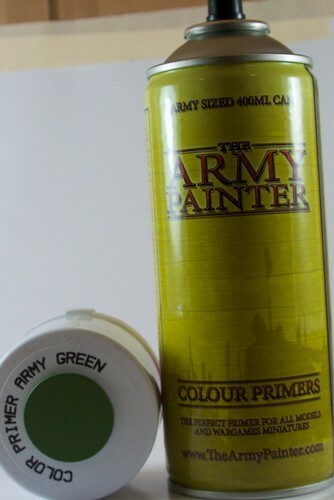 I have seen a lot of people talking about Army Painter (thearmypainter.com) and several have no idea what is going on. Others wish to know just how well this works. So, here we go a simple tutorial in using the Army Painter Method. This is also known as the dipping method in some circles, but I like calling it this. The terms are certainly interchangeable. First off, this is a method. Nothing more or less. Its a method in the same way that drybrushing, wet blending, sharp highlight, etc is a method. Its not for everyone in every situation. However, it is excellent for getting models painted quickly to a tournament standard. At the core, you use a shader (more on this below) on top of base colors in order to give the model depth (shades and highlights). The focus is on speed, while creating great looking models. 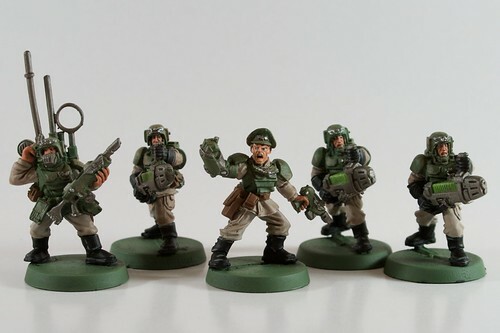 It is great for being able to shade models with lots of detail, but it won’t look as good on models with lots of flat areas, like space marine armor. A primer, a shader, and most commonly a matte spray. Primer- you can use GW’s white or black as normal and then use their air brush to cover the model in one color. However, there is a simpler method. Army Painter has colored primers for about $12 which are excellent. In fact, these are my new primers for all applications. You can use GW’s color primer cans ($15) if you wish. Avoid cheep primers- if you have a $1 model, then use a $1 primer. Shader- Army Painter has cans of shades ($26) that is essentially a wood polish. Many people are using this:http://www.minwax.com/products/one_s...es.html#Colors. I like this for many reasons, one you get many more color options and two the price is cheaper. A one US Quart size is $11.84 and the smaller half-quart is $6.97. I’d advise to buy a couple of half-quarts because you won’t use much of it and you can play with the colors at will. Matte Spray- because the shader will leave a shine to the models, you will want to use a matte spray to take the shine off and it will help to ‘blend’ the colors in your models. See below. 1. 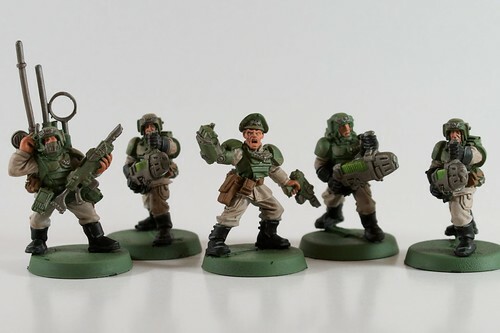 Prime your models as normal, for my Imperial Guard Command Squad I used AP’s Army Green. 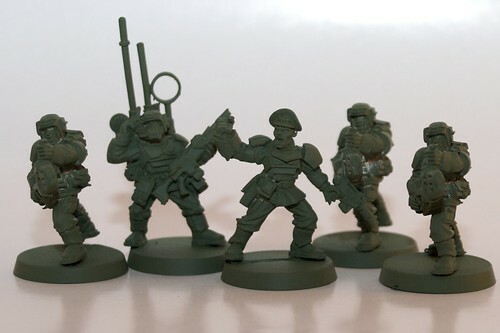 These are metal models, but it works great on the plastic guardsmen as well. Follow the directions on the can carefully, this is a high pigment spray and you need to pay attention. You can also get some other high pigment sprays from nicer art stores if you live in the appropriate area. 2. Paint a base color on your models as below. Remember, this color is essentially going to be the ‘highlight’ or at least a base color + highlight. You will need to relearn some of your color combinations when doing this. I used the following colors: armor (gretchin green), cloth (dheneb stone), skin (dwarf flesh), metal (boltgun), boots (black). 4. At this point all you need to do is use a Matte Spray. I like the Krylon Sprays at Lowe’s for about $6. You’ll pay $9 at thewarstore, higher at other places. Again, follow the directions on the can. Notice that the armor has become ‘muddy’ or brown, the highlights are not as clean. 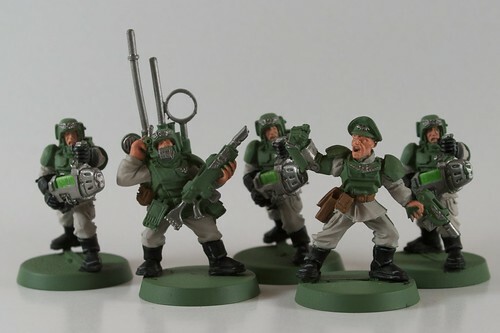 However on the fatigues it looks great, and I like the look on the las/plasm guns. The shader will create a nice graded depth to the model leaving you to add a sharp highlight if you want (see below). I still need to finish a couple of items on the Vox Caster, but I ran out of steam. In summary: this took me less than 3 hours active painting time over the weekend to get a completed unit sans basing. Normally this would have taken me close to 10 hours to get moderately better results (perhaps not much better). However, I found my self hating how the models looked, right up until the end. So stay the course, and wait until you get your Matte Spray on to judge your models. Should I use this? Well, it depends. 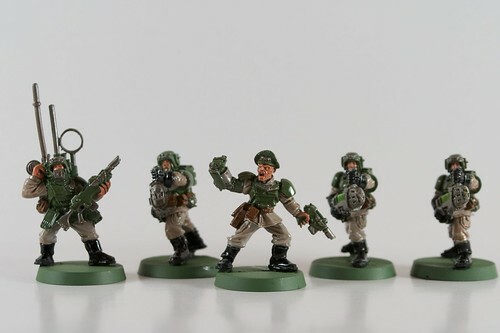 I wanted to get around 50 imperial guard troops done quickly so that I could move to the tanks... what I really like! This method got me to my goal very fast and I am happy with the results. However, I wouldn’t use this method on Marine armor, Eldar, or Tau. Tyranids, Demons, (?) Orks, and Imperial Guard are good options for this method. Other armies are possible, depending on what you are aiming for. Optimally, the place to use this is with your square base models. For those gamers, this may save your sanity! Where to go with this? I probably wont use the AP/Dipping method on my next army (Eldar or Orks)- however, I will make use of the AP sprays and then use GW Foundation paints with GW Washes. I’ll use a traditional sharp highlight on top of that... and achieve a similar result at the cost of a bit more time. But that is just me.